Compiling and flashing the hacked firmware for the hoverboard-circuitboards isn't obvious. So for me to remember what I have been doing and also maybe for those who want to try this too I wrote this short instruction which will describe what I did and what worked for me. Not saying its the only or even right way. Also I'm not the creator of this hacked firmware and therefore I am not able to help with in-depth problems. Please also keep in mind that there is a probability that your board can be destroyed. I'm assuming your using Linux, more specifically some kind of Ubuntu based Linux. The programmer I am going to be using is a cheap ST-Link V2. In order to compile, gcc-arm is needed. .. or downloading and extracting yourself. If the file build/hover.bin exists compiling worked without problems. Now you should make your own adjustments to the settings. This is mainly done by (un-)commenting things like control method in the Inc/config.h. (Sometimes the endpoints have to be calculated and entered in the src/main.c file. Just search for #ifdef CONTROL_ADC. Connect the cables from the motor to the controller first by mathing the colors. If the motor does not spin smooth (which is likely) try swithing the colors around. Theres only one working combination. 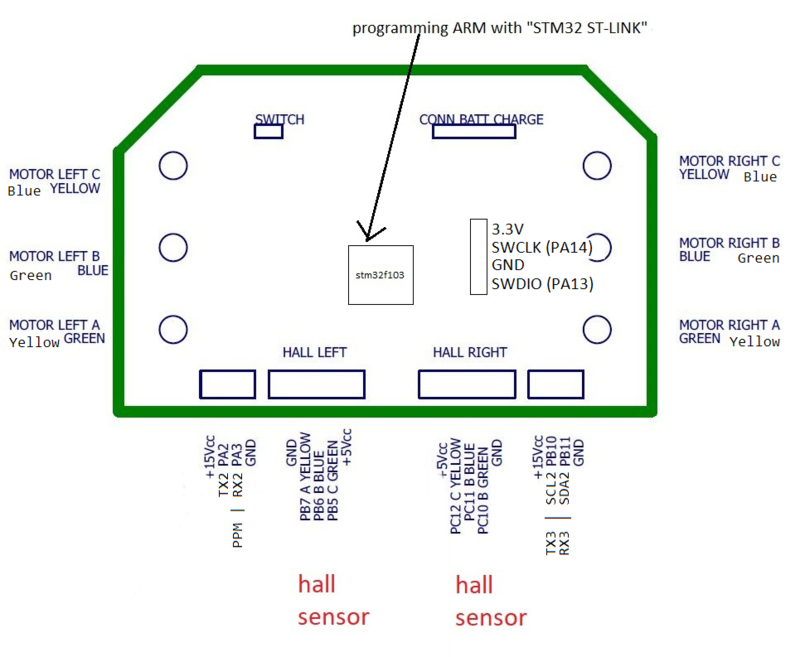 Connect the hallsensor. The long wires belong to the motor with the long motor wires. Connect a poti or your pwm signal to the green wire from the remaining long unused 4 pin connector "RX2 / PA3". Dont forget GND. 3.3V Signal Level! Plug the ST-Link V2 into your USB port. Plug in a 10S Lipo/LiIon Battery or even better a powersupply with 40V and overcurrent protection. Push the power button and keep it held down during flashing! If the chipid isn't 0x0000 the stm got recognized. On a fresh board the STM is locked an has to be unlocked in order to be able to write to it. Press and hold the power button! openocd -f interface/stlink-v2.cfg -f target/stm32f1x.cfg -c init -c "stm32f1x unlock 0"
Press and hold the power button during flashing! The board can now be powered up by pressing the power button. -> Funny beeping sounds. Try increasing the throttle slowly. You can do this with only one motor connected. I would recommend to use a bench power supply set to 40V and a current limit of 0.5A. If you're using a power supply decrease the throttle slowly, currents from recuperation can kill your powersupply. If the motor doesn't turn even if a significant amount of current flows or the motor stutters you should first test all possible motor-controller wire configurations.